VisitTemeculaValley.com announces 12 artisan food and wine experiences in Temecula Valley Southern California Wine Country including Briar Rose, Cougar, Doffo, Lumiere, Oak Mountain, Palumbo, and Vindemia wineries; EAT Marketplace and Eatery, Palumbo’s Ristorante, Robin’s Nest Desserts, Old Town Spice and Tea Merchants, and Temecula Olive Oil Company. The inspired, beyond-the-ordinary experiences combine to make three days and two nights genuinely nourishing in the casual, picturesque getaway and vacation destination located 60 minutes from San Diego, Orange County, and Palm Springs; 90 minutes from Los Angeles and Hollywood. “Twelve Temecula Valley Southern California Wine Country artisan food and wine experiences combine to make three days and two nights genuinely nourishing," announced Kimberly Adams, president and CEO, Visit Temecula Valley. Temecula Valley Southern California Wine Country, July 22, 2014: “Twelve Temecula Valley Southern California Wine Country artisan food and wine experiences combine to make three days and two nights genuinely nourishing. Savor like locals at Briar Rose, Cougar, Doffo, Lumiere, Oak Mountain, Palumbo, and Vindemia wineries; EAT Marketplace, Palumbo’s Ristorante, Robin’s Nest, Old Town Spice and Tea, and Temecula Olive Oil,” announced Kimberly Adams, president and CEO, Visit Temecula Valley (formerly the Temecula Valley Convention & Visitors Bureau). “Less-busy weekdays are ideal; resorts, hotels, and motels offer special, Sunday-through-Thursday nightly room rates.” Welcoming more than 2 million visitors, Temecula Valley is 60 minutes from San Diego, Orange County, Palm Springs; 90 minutes from Los Angeles and Hollywood. This historic fairy tale, cottage-style winery produces fine, award winning, handcrafted, small-lot, premium, estate wines including Cabernet Sauvignon, Zinfandel, Cabernet Franc, Sangiovese, Viognier, and Chardonnay. Also produced are a Super Tuscan and the bubbly wine lager Talking Frog. Wine tasting is by reservation only. With tasting room and picnic area valley views, this boutique producer specializes in estate-grown Italian varietals including Brachetto, Lambrusca di Alessandria, Sangiovese, Primitivo, Montepulciano, and Pinot Grigio. By reservation, guests enjoy a tour highlighting vineyard practices and the winemaking process. The micro-boutique winery’s hospitality reveals the charm of Argentine and Italian heritage. Classical music plays in the vineyard; nurtured grapes produce rich fruit for the small lot wines. By reservation is a premium wine tasting and vineyard tour aboard an eco-friendly Ferrari-style open-air mini-bus. At one of the Temecula Valley AVA, newer boutique wineries, estate grown and bottled, premium, hand crafted, Bordeaux-style, small-lot wines are the specialty. Wines include red and white varietals, and Bordeaux-style blends. The Meritage Black Cab is a recent award winner. 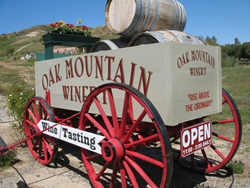 Wines from Oak Mountain (classic Bordeaux, Merlot, Cabernet Sauvignon) and Temecula Hills (Rhone varietals, Cabernet Sauvignon, Syrah) are available for tasting at Oak Mountain Winery. The picnic area overlooks hillsides of vineyards. Wine education, by reservation, includes classes like Wine 101, and Bubbles 101. Known for exceptional quality, the commitment is to estate-grown wines with character and sophistication. Specialties are full-bodied reds, single-varietals, and a few special blends. Acclaimed is the elegant Tre Fratelli Meritage. By reservation is Barrel Tasting, Tour, and Lunch with the Winemaker. Nestled in part of the valley less traveled, handcrafted wines are produced from Viognier, Sauvignon Blanc, Cabernet Franc, Cabernet Sauvignon, and Syrah - Sunset International Wine Competition gold medal winner. Companion enterprise, California Dreamin’ provides Temecula Valley Wine Country hot air balloon flights. Hip, sustainably minded, regionally sourced, locally foraged EAT is ideal for breakfast (frittata, paleo pancakes); and lunch (wraps, vegan wraps, carnivore sandwiches). EAT is also popular for coffee (fresh-ground organic, sustainable, beyond-fair-trade coffee; cold-brewed, coffee-smoothies); and picnic feasts to-go. Traditional, authentic-family-recipe Italian cuisine is accompanied by excellent service. Sauces, soups, sausage, meatballs, ravioli, gnocchi, focaccia, tiramisu, and cannoli are freshly house-made. The menu includes thin-crust pizzas; spaghetti carbonara, classic lasagna, eggplant parmigiana; chicken marsala; grilled lamb chops, linguine with clams, wild-caught salmon florentine. At Fifth Street and Mercedes, Robin’s Nest specializes in baking memorable desserts from scratch using local, organic, and natural ingredients. Thoughtfully prepared and graciously served are delicious, fresh-baked cake, pound cake, cheesecake, pie, cobbler, cookies, and old-fashioned teacakes. Fine spices, herbs, sea salts, and loose teas provide seasonal inspirations for cooking, baking, barbecuing, hot, and iced tea. Summer may feature Old Town savory spice-blend; autumn, house-made pumpkin dip mix; winter, cocoas; spring, herbal teas and fruit sugars. Different products are sampled daily. The retail shop and tasting room garner an exceptional following for sustainable growing practices and quality, fresh, pure, and flavorful, 100% Southern California, 100% extra virgin, hand-blended, limited edition olive oils. Olive oil and balsamic vinegar tasting is complimentary daily. *Information is believed accurate but may change. With natural gifts of climate and geography (Pu’eska Mountain, Rainbow and Santa Margarita Gaps), Temecula Valley is recognized for scenic vineyards, award-winning wines, and gracious wineries as Temecula Valley Southern California Wine Country. Home to three-time California Golden State Winery of the Year, South Coast Winery, the boutique destination also includes Downtown Old Town Temecula, Pechanga Resort & Casino, and Temecula Wine Country Golf Trail. Visit Temecula Valley (formerly Temecula Valley Convention & Visitors Bureau), regional tourism marketing organization and resource for visitors, is online at VisitTemeculaValley.com; Facebook, “Temecula Valley Southern California Wine Country”; Twitter, @Visit_Temecula; and FilmTemecula.com. Temecula Valley Visitors Center is located in Old Town Temecula; 888/363-2852, 951/491-6085.